Gourmet Sandwich Shop Joins Slew of New Businesses Along Malcolm X Blvd. 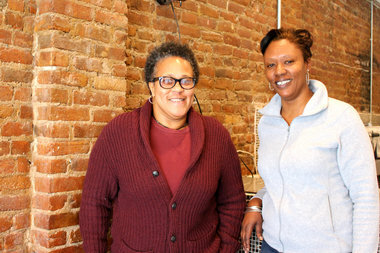 Rogenia Davis (left) and Melanie Graves-Singletary, owners of Ikhofi Cafe at 199 Malcolm X Blvd., are among several business owners setting up shop along the commercial corridor. BEDFORD-STUYVESANT — A Malcolm X Boulevard store is opening to bring gourmet sandwiches to Bed-Stuy, the latest of a host of new businesses moving onto the corridor. Ikhofi Café at 199 Malcolm X Blvd. near Putnam Avenue is set to open by the end of April, according to owners Rogenia Davis and Melanie Graves-Singletary. The roughly 325-square-foot space will offer seating for around six people, serving up made-to-order and specialty sandwiches including selections named after local streets like “The Putnam” (fresh-baked oven-roasted turkey breast), and “The Marcus Garvey” (grilled smoked jerk chicken). Sandwiches start at $5.50, and customers can also choose from breakfast items, pastries, soups and coffees. “We had talked about it for a long time: the need for a certain level of quality food in the neighborhood, and also the need for delivery,” said Graves-Singletary, 45, whose family has lived a block from the new café for decades. The duo aims to employ residents from the neighborhood, they said. The menu will expand to include recipes and dishes from Graves-Singletary and Davis’ families, and the owners look to decorate the space with African woodwork and carvings, as well as personal photos and those showcasing the old neighborhood. Ikhofi Café is among the latest batch of new retail along Malcolm X Boulevard, with other recent additions including nearby juice bar and vegan bakery Natural Blend. The commercial strip has seen a “resurgence” in recent years, according to local real estate brokers, with several future business planned including a ramen restaurant, an Indian eatery, a café, grocery store and the relocation of Fort Greene’s Chez Oskar. With a variety of shops popping up, other businesses are beginning to follow suit in scouting the corridor as a prime location, according to Halstead Property broker Ban Leow. Michael Jordan boutique shop Jordan Heads Brooklyn opened in 2014, followed by the makeover at longtime watering hole Casablanca and French bistro L’Antagoniste set up shop in 2015. Later in the year, Polish café Zabka opened its doors near the intersection of Malcolm X and Halsey Street. “I think they are beginning to realize we really need to establish a strip where every commercial space is filled with restaurants and shops, and make it a live wire,” Leow said. Rental prices for commercial properties can go up to $50 per square foot, he added, compared to two years ago when they averaged around $20. “One needs to pick and seize the opportunity when it presents itself, and the time is now,” Leow said. Malcolm X Boulevard, formerly known as Reid Avenue, used to be a “hustle and bustle” corridor in Bed-Stuy with vibrant retail, local residents said. Running from Broadway to Fulton, there were a variety of butcher shops, clothing stores and barbershops, residents said. Later on in the 1980s and '90s when drugs were rampant in the neighborhood and many residents began to leave, the boulevard saw a high number of vacancies, according to locals. Compared to other major commercial thoroughfares such as Bedford and Tompkins avenues, Malcolm X was “lagging behind” and had the largest number of empty storefronts, according to Emilio Dorcely, president and CEO of Bridge Street Development Corporation. The not-for-profit has been working to revitalize and support main corridors in the neighborhood, including Malcolm X, with activities like the upcoming ‘Feast Bed-Stuy’ food and drink tour. The two-way boulevard’s proximity to buses and trains, as well as its walkability and lower prices compared to other strips are causing business owners to take a second look, Dorcely said. “People would like to see it come back to its former glory of a hustle and bustle corridor with types of diversity of businesses that cater to a wider variety of people across an economic spectrum,” Dorcely said. The development on Malcolm X follows suit with the boom throughout the neighborhood, according to Dorcely and locals. Commercial growth follows residential, and the boulevard is no exception, said Richard Flateau, president of Flateau Realty Corp.
More people in the surrounding areas may be deciding to work in the neighborhood they live in, which could contribute to an increase in local businesses, he added. Malcolm X Boulevard’s proximity to Stuyvesant Heights also brings foot traffic, Flateau said. Its location near the historic district caters to a different clientele made up primarily of families, Leow added, compared to a younger demographic in areas like Bedford Avenue. “I always wanted it to become the Smith Street of Bed-Stuy, which is a potential,” he added, referring to the popular commercial corridor in Boerum Hill and Carroll Gardens.